More than 252 terrorists, including top A++ category terrorists, were eliminated in encounters last year as a result of which the spine of the terror organisations has been broken. Fresh infiltration of trained terrorists from Pakistan and Pakistan-occupied Kashmir (POK) has also become difficult because of the heightened vigil of the Army and the BSF. Intelligence sources say that the grenade attacks ahead of the Republic Day were an attempt of terrorists and their mentors sitting in Pakistan to keep the pot boiling and show their strength in the valley. The current spate of grenade attacks began last month with one being tossed in the busy general bus stand in Jammu. Thereafter, several grenade attacks have been reported from various parts of the valley. Terrorists are also using under-barrel grenade launchers (UBGL) to lob grenades from a distance. A grenade attack at a CRPF picket in Srinagar’s busy Lal Chowk last Friday created panic. This was the second such attack within 20 hours after the one near the Zero Bridge where three policemen were injured. Soon after that another grenade attack was reported at a camp of the Special Operations Group (SOG) in the Gagran area of Shopian in South Kashmir. Terror outfit Jaish-e-Mohammad (JeM) has claimed responsibility of the grenade attacks. The police station at Yaripura in the Kulgam district of South Kashmir was attacked with grenades yesterday night. However, no damage was reported. One person was yesterday injured in a blast near a school on the KP Road in Anantnag. South Kashmir, which has emerged as the virtual breeding ground of terrorism, witnessed a grenade blast on Friday inside the police station compound at Pulwama. The police, during a search at a barrier in Kupwara, arrested a person identified as Mohammad Aslam and seized a grenade from his possession. During initial interrogation, he told the police that he was motivated to turn towards terrorism by a Pakistan-based social media group. The security forces recently arrested a woman on the outskirts of Srinagar where she was carrying a cache of 20 hand grenades and ammunition. The woman was found to be an Over Ground Worker (OGW) of terrorists and was coming from Baramulla in a car to deliver the consignment to terrorists. 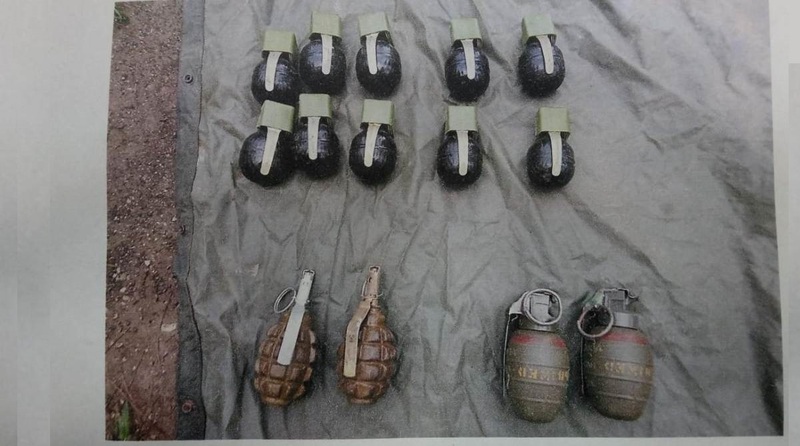 During recent raids on hideouts of terrorists in the Kashmir valley and Poonch and Kishtwar districts of Jammu, security forces had recovered cache of grenades and other ammunition. Warlike stores, including one AK-56 rifle, 14 grenades, 273 rounds of AK-47, 97 rounds of AK-56 and other ammunition, were recovered from one of the hideouts in Poonch.